Light-weight, quick-folding bike for this ride + métro commute? I'm trying to find a bike that would suit a middle-aged woman about 1,65m/5'4" whose commute involves a bike ride from home folding the bike walking down the stairs to the platform riding the subway in rush hour (ie. packed, but no change) carrying the bike up the stairs unfolding riding it to the office. Rinse and repeat in the evening. A Brompton + OffYerBikeOnYerShoulder handle + shoulder strap could almost foot the bill, but at 12kg, it's getting a bit on the heavy side. I also suggested the Strida, but its frame + seating didn't work out. Can you think of any other folding contraption I should look into? For much more money (1,400€), there's the Kwiggle from Germany that's supposed to be available sometime in 2018, but for that kind of money, might as well get a Brompton. E-scooters with larger wheels are just too heavy to carry up/down stairs. Last edited by Winfried; 06-26-18 at 02:24 PM. I think a Pacific Cycles CarryMe is around 18 lbs/8 kgs. FSIRs are light, use no proprietary parts, fold quick and easy. Unlike Brompton, FSIR takes standard freehubs and dereilleurs so you can gear them as you like, their handleposts are modern, folding-bike standard so they don't flex, take the more plush 305-size tires, and are so affordably priced that you can buy three, four FSIR Spin for the price of a Brompton. In North America they are rebranded as Solorock. In both cases, they are very sensible value. You'll be able to reduce their already low stock weight by swapping the square taper crankset for a Hollowtech crankset. if you don't need Brompton's quick and small fold, there are options out there, many of them sensibly priced and without the compromises and disadvantages that accompany Bromptons. You don't have to follow the herd. Last edited by Abu Mahendra; 06-27-18 at 05:53 PM. My Bike Friday pakiT is sub 19lbs, folds quickly and easily (although longer than a brompton, but a bit narrower). I take it on public transportation all the time and carry up several flights of stairs (I have a version of the Off Yer Bike handle on it). I carry it around folded inside stores while shopping and it also fits easily in grocery carts. For me, the big issue was weight because i am the same height as you and a senior citizen. My bike weighs less than a full grocery sack. You can configure it exactly the way you want which helps address the weight issues by choosing lighter components/frame. However, you are in Europe so I don't know how feasible it is for you (especially with the tariff wars, please don't get me started, lol). But I don't think you will find a better riding folder under 20 lbs; I know I tried. Last edited by linberl; 06-26-18 at 05:53 PM. Why not just involve your wife? Is this a surprise present? What country are you in? Is new that important? How does she choose what she likes? Linberyl's Pakit is probably one of the best smaller folders to ride, but would be expensive outside NA. In England, a used Brompton would be a no brainer. You can upgrade with lighter parts over time. The Tyrell Ive is also on my short list. Fairly compact. Well thought out. Made in Japan. Uses standard parts. The Carryme was surprisingly fun with good ride quality, but she may not like the looks. Very compact. Or you can go cheap and get a small dahon. It will work, and let her appreciate a better folder in the future. Considering the weight + size issue — it needs to be carried up/down stairs and kept in crowded subways —, it looks like the CarryMe or a 10kg e-scooter are the only options. 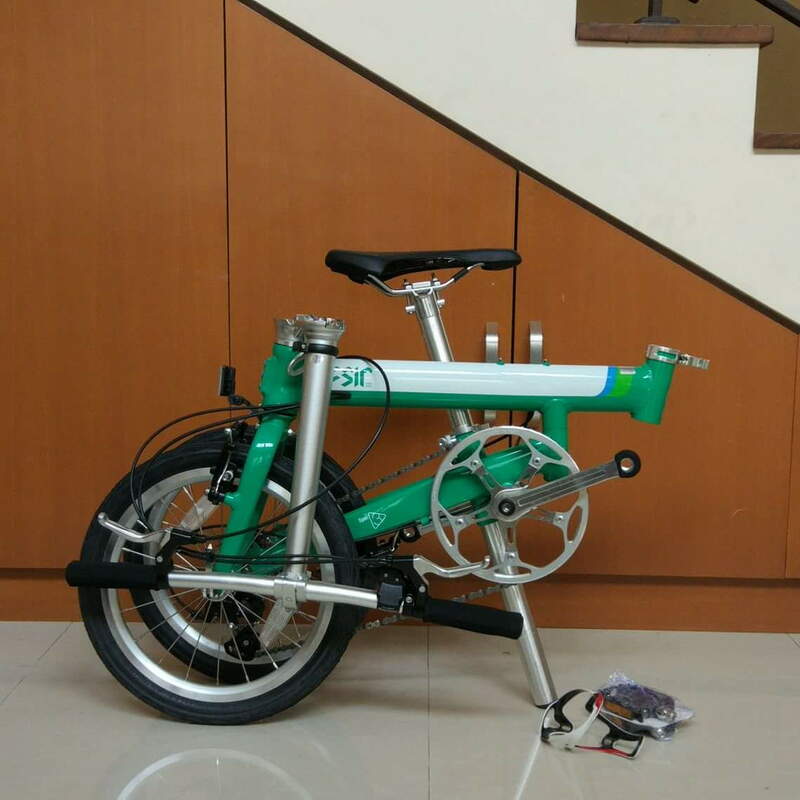 A female friend is riding the 9kg electric NoaHK for several months now. She is very happy with it. Personally I think it is too early to say whether it was a good choice, but then anything else electric you might need to consider has a similarly thin record. you seem to have many , sell one of those to them..
was for an All Titanium custom version of a Xooter Swift..
hand made in China, PRC i Guess.. I assume those came out pretty light..
Last edited by fietsbob; 07-12-18 at 11:08 AM. Thanks for the pointer. Incidently, I forgot that bike, which happens to be designed in France and built in China, so after-sales support is available. 1. How does it roll when folded? I'll drop them an e-mail. Last edited by Winfried; 07-05-18 at 04:37 AM. How about a Brompton S2lx - the titanium version, S model, w/o rack is in my eyes one of the best choices for that purpose. The E w/o blades and with the short seat post is at or below the 10kg spot. Personally I'd add blades on a commuter bike and a high quality, lightweight hub dynamo as well (SON or SP, the latter is a bit lower quality and cheaper; the shimano outlines itself due to weight) and possibly save on weight by changing the steel seatpost for a titanium one. For a person of that size shorter cranks are a good idea, too. A colleague of mine is in the same ballpark sizewise and this is what she ended up with (apart from the titanium post) after a lot of testing. If necessary with some aftermarket parts you can get below the 10kg mark. The upfront investment is on the steep side, but for a bike that is used on a daily basis for years and years over time the price does not really matter - practicality, quality, reliability, good service and the availability of parts do. And as we all know Bromptons keep their value pretty well, so the monthly running cost (including value loss) of such a bike is close to irrelevant and not really higher than those of a cheaper bike. Fire up a spreadsheet and do the maths, if you don't believe it. Bike Friday makes an exceedingly lightweight (As little as 15lbs) bike for smaller riders. I'm thinking of this for my 125lbs wife. She can't really carry around a Brompton. Don't know. I gave you the link. ok Chain Drive Starting at $1,150, belt is more. The titanium Brompton is a bit on the expensive side, and Bike Fridays are not distributed here, so there's no way to try it before purchase (besides the issue of after-sales service). Looks like it's either the CarryMe or an e-scooter. but they are each made for the buyer, to order, not an all the same mass production..
they will make every effort to make it's fit the same. and they will quote you an invoice estimate.. The Pakit is much more standardized with 4 frame sizes. Other than changing the stem, the fit is pretty much the same. I test rode a size small Pakit before I bought mine; the owner chose to set it very upright so I had "imagine" my preferred riding position but it was easy enough to get a good sense of the bike (which helped inform the upgrades I made). The Pakit is different from the NWT, Rocket, Llama, and Crusoe in this regard; it's a bit more mass produced than the other BF. I'm 5'4" and 130 lbs. My Pakit is a little under 19lbs (including saddle/pedals) and I can easily carry it, lift it into shopping carts, etc. Couldn't do that with my NWT @ 24ish pounds. i am not interested in a Bike Friday, bob. I am not willing to pay the price premium of customization options, after-sales support and developed world labor market wages and taxes. I asked the question in order to flush out an often-ignored issue, one that is often left out of the discussion - price. Far too often suggestions are thrown about with little regard for price. Brompton, Bike Friday, etc. are nice bikes, unique in their own right and all, but they are undeniably expensive (or over-priced, depending on the alternatives available to you, or the alternatives to which you allow yourself to be open to). A bit of perspective and self-awareness is in order, I believe. 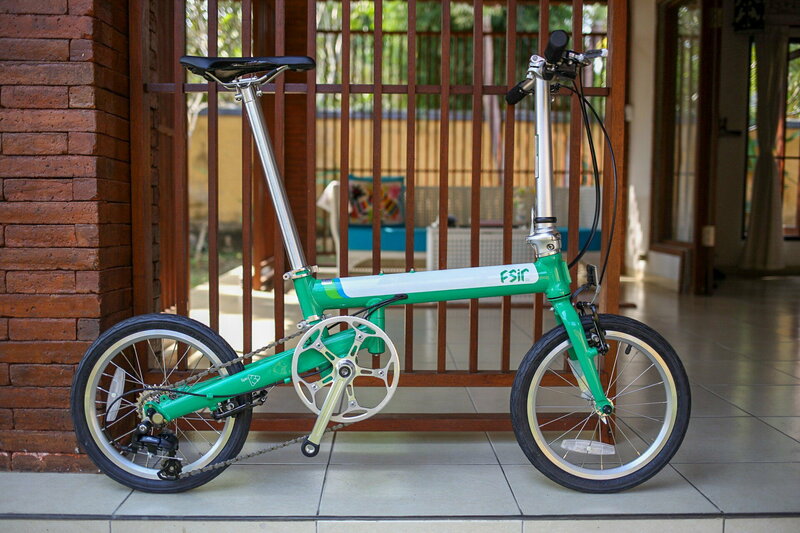 Believe it or not, the world of folding bikes is much wider than B & BF. Last edited by Abu Mahendra; 07-11-18 at 07:33 PM. Abu, we know you hate British and American products. You're not doing anything to help the OP buy a bike. 1. I do not hate or love the products of any particular country. I do not fetish-ize bicycles, or submit to brand-cultism. You are plainly distorting my views to counter the challenges I have launched against the prevailing norms and biases of this channel, and to the pervasive brand-cultism. 2. You will note that in post no. 3 of this thread I offered a concrete suggestion to the OP. You, on the other hand, have offered none, instead assuming your usual officious back-seat modding. Last edited by Abu Mahendra; 07-11-18 at 11:16 PM. The OP doesn't need another suggestion, so I didn't offer one. You, on the other hand, are trolling with your weird issues with bikes made in England and the USA. Get over it. CarryMe will be a nice choice in this scenario. It is no fun to carry a brompton. And the rather short distance ride should be tolerable even with CarryMe. Yes, I tried it, and it runs nicely, although I wouldn't mind a Nexus 3 in the back, and a Brompton-compatible lug to carry a bag in the front. You didn't mention your budget in the first post so I suppose there's still the Hummingbird as an option....maybe it's cheaper to buy if you live over there?